Druitt, Montague John: What makes Druitt a viable suspect? - by GUT 40 minutes ago. Interested in advertising on Casebook: Jack the Ripper? We receive over one million page-views every month - what better venue to market your product or service than on Casebook: Jack the Ripper! Our readers are primarily in the 18-35 age-group, evenly split between males and females. Our average reader spends nearly 30 minutes per visit on the Casebook. 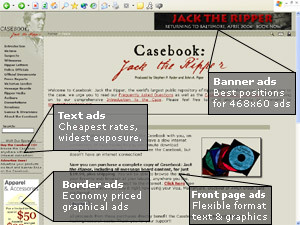 There are numerous options available to those who wish to purchase advertising on www.casebook.org. You can order your advertising space right now using your credit card by clicking the "Order now!" links next to each particular option. Your payment will be processed by Paypal's secure servers, and we will contact you straight away to discuss content, graphics, placement and timing. Please contact us with questions or comments - we'll be glad to tailor an advertising solution to your individual needs. Front page ads... versatility and top-performance. One week ~28,000 views $99.99 Order now! Two weeks ~56,000 views $159.99 Order now! One month ~120,000 views $279.99 Order now! Two months ~240,000 views $439.99 Order now! Contact Stephen P. Ryder at inquiries_advertising casebook.org for more information.